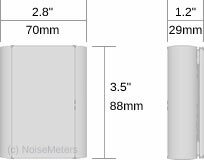 The industrial noise warning sign and interface module can be mounted on a wall or other suitable surface. 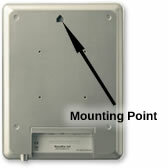 An optional adjustable VESA mount can be used for more secure or corner mounting if needed. 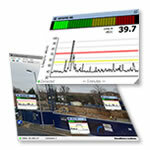 It measures the sound levels in line with the noise measurement standards (IEC 61672 Class 2, ANSI S1.4 Type 1), stores the results, and makes them available to the LiveNoise Supervisor and Reporter software over your network, or to our cloud server over the Internet. An HDMI output can be used to display the live sound levels on a computer monitor or HDMI television. 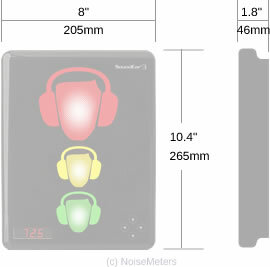 The LiveNoise Terminal can communicate with the LiveNoise Supervisor software to provide a real-time display of sound levels and for long-term noise measurement storage. 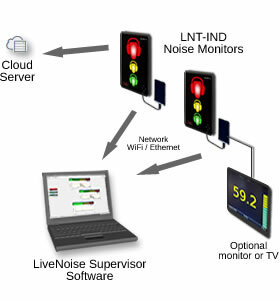 With the Supervisor software running on a computer on your network, the LNT-IND noise monitor just needs WiFi access or a wired Ethernet connection to the same network. 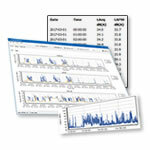 The LNT-IND will need to be connected to your network in order to send the noise measurements to the Supervisor software or to the cloud server, depending on your configuration.